As we move into summertime living, we’re surrounded by floral scents and luscious fields of ripening produce. 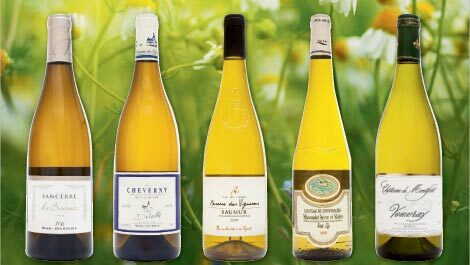 With pastures and picnics in mind, we pay homage to France’s leading producer of white wines: the Loire Valley. The fragrances of these five selections provide the ideal complement to the first fruits of the season, as well as tender green peas and asparagus. Les Baronnes Sancerre 2009 $28 A grassy freshness greets the senses at the first inhale of this sauvignon blanc, redolent of grapefruit and honeysuckle with a touch of butter, basil, and flint. Oysters would be a harmonious pairing, as would a delicately pan-fried sole meunière or flounder. Domaine du Salvard Cheverny 2009 $16 The opulent Renaissance-style Château de Cheverny is famous for its hunting dogs and pleasing summer wines. This particular bottle brings notes of field and flowers, as well as mint and pennyroyal. Try it with asparagus or oysters. Réserve des Vignerons Saumur 2009 $10 The city of Saumur is known for horses and caves where button mushrooms grow, as well as for its wines. This reserve is 100 percent Chenin Blanc, and is soft, crisp, and reminiscent of overripe fruit. Try it with melon, strawberries, peaches, or if you’re more adventurous, pair it with eel. Chateau de l’Hyvernière Muscadet Sèvre et Maine Sur Lie 2008 $15 From the western part of the Loire Valley, muscadet is made from a grape called Melon de Bourgogne. This wine has a wild side accented with pepper, but is also subtly sweet. Try it with grilled chicken, fish, pork, octopus, or a pungent cheese. Château de Montfort Vouvray 2008 $20 This semi-dry gem from Château de Montfort breathes notes of honey and pineapple. It would be a lovely accompaniment to foie gras, pâté, or olives de Provence. Also excellent as a dessert wine, pair it with crème brûlée, apple pie, or jam and bread for brunch.